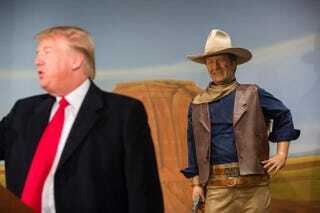 Republican presidential candidate Donald Trump speaks at the John Wayne Birthplace & Museum in Winterset, Iowa, on Jan. 19, 2016. Trump received the endorsement of Aissa Wayne, Wayne’s daughter. Although he is one of the country’s most iconic film stars, longtime California resident John Wayne will not be getting a day of honor in his home state. I believe in white supremacy, until the blacks are educated to a point of responsibility. I don’t believe giving authority and positions of leadership and judgment to irresponsible people. … I don’t feel we did wrong in taking this great country away from [the Native Americans]. … Our so-called stealing of this country from them was just a matter of survival. There were great numbers of people who needed new land, and the Indians were selfishly trying to keep it for themselves. Assemblyman Mike Gipson, a black Democrat, said that he appreciated Wayne’s contributions to film but found his views offensive. “Certainly his movies are one thing, but in terms of his private life, and also his views, I find them very offensive,” Gipson said. Read more at the Associated Press and TelesurTV.